Thirty minutes and five ingredients are all you need to get this fresh-flavored lamb dish on the dinner table. Nestle an oregano sprig under each serving for a lively garnish. A side of orzo pilaf rounds out the menu. Combine lemon juice, olive oil, oregano, and garlic in a large zip-top plastic bag. Add lamb to bag, turning to coat. Seal and marinate at room temperature 15 minutes, turning occasionally. Heat a grill pan over medium-high heat. 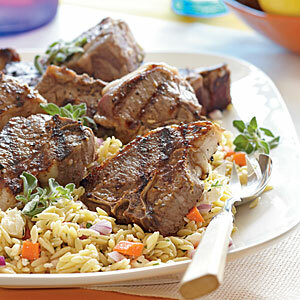 Remove lamb from marinade; discard marinade. Sprinkle lamb evenly with salt and pepper. Coat pan with cooking spray. Add lamb to pan, and cook for 3 minutes on each side or until desired degree of done-ness. Orzo pilaf: Combine 2 cups cooked orzo, 1/4 cup crumbled feta cheese, 1/4 cup finely chopped red onion, 1/4 cup finely chopped carrot, 3 tablespoons chopped fresh flat-leaf parsley, 1 tablespoon red wine vinegar, 1 tablespoon extra-virgin olive oil, 1/4 teaspoon salt, and 1/8 teaspoon black pepper; toss well to coat. At only 220 calories per serving with 28.7g of protein and 23mg of calcium…. ENJOY!